Hey Everyone! So I decided to start up this blog to share with you all a condensed version of my favorite findings from the many daily emails I get and the insider information I always seem to stumble across. Now you all will know what I know... sort of! Feel free to subscribe to this since I plan on writing pretty regularly, and already have an arsenal of information I want to share ready for those days that there really isn't anything new going on! So to start it off, I'd like to speak about something very near and dear to my heart: drunk web surfing. We all like to do it when we get home at 2am and still have some energy to burn. Some like to shop. Some like to post incomprehensible Facebook messages that they can laugh at the next day. I myself am guilty of requesting to be friends with my best friend's ex-boyfriend on her account... don't ask! But this becomes dangerous when you decide to email those specific few you should not at this odd hour and confess to them your life story. Some of these few could be that ex boyfriend you swore off, that backstabbing best friend you would never swallow your pride to talk to again, or maybe that crush that never knew you worshipped the ground he walked on. Google to the rescue! 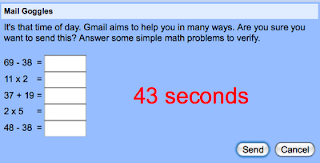 If you have a gmail account you can now enable Mail Goggles, a feature that requires you to do simple mathematical equations before allowing you to send out the late night word vomit! Once enabled, you can adjust the settings so it will only turn on during late night hours. So now you can drunk web surf freely. You can thank me later!